Konstantinos Michmizos wins the NIH K Career Development Award on Neurorehabilitation Robotics. The NIH K Awards are given to Professors who have demonstrated abilities to become leaders in their field. The K Career Award ($250K, 2 years) will enable Konstantinos to combine Biological and Artificial Learning, in collaboration with Hermano Igo Krebs (MIT), Amy J. Bastian (JHU), and Matti Hamalainen (Harvard Medical School). Congratulations to Desheng Zhang (PI) and Dimitris Metaxas (Co-PI) for having the project titled “S&AS: FND: COLLAB: Adaptable Vehicular Sensing and Control for Fleet-Oriented Systems in Smart Cities” awarded by the National Science Foundation (NSF). This a collaborative project with Prof. Fei Miao from the University of Connecticut with a total budget of $599,883. The Defense Intelligence Agency (DIA) has awarded Rutgers University a $2M grant for the development of a Critical Technology Studies Program. This new program will build on Rutgers’ 2015 designation as an Intelligence Community Center for Academic Excellence, and expand student capabilities in the data sciences, machine learning, artificial intelligence, computer vision, and computationally efficient modeling techniques. "CAREER: Breaking Through the Optimality-Efficiency Barrier in Multi-Body Motion Planning"
recommended for funding (budget: $549,500) by the National Science Foundation (NSF). The CAREER Program is an NSF-wide activity that offers the National Science Foundation's most prestigious awards in support of early-career faculty, who have the potential to serve as academic role models in research and education and to lead advances in the mission of their department or organization. Go behind the scenes at WRSU as music director Mica Finehart, a Computer Science major and honors student, talks about the station’s music selection process, ways students can get involved, and what she’s listening to now. Prof. Tomasz Imielinski receives the 2018 The Tadeusz Sendzimir Applied Sciences Award "for his outstanding contributions to computer science and its applications" from the Polish Institute of Arts and Sciences in America (PIASA). Sridhar Sriram, a senior computer science major, has been awarded a Gates Cambridge scholarship. One of only thirty-four US students chosen for this prize, Sridhar's interests are in reducing bias in technology. Read all about him here. Konstantinos Michmizos wins the BHI Award on "Computational Astrocyence"
Konstantinos Michmizos wins the Rutgers Brain Health Institute Grant Award for the proposal entitled "Computational Astrocyence." Congratulations to Prof. Trees, Nguyen and their colleagues for their project "Addressing Issues of Equity and Engagement in CS through a Research Practice Partnership: The CS Teaching and Learning Collaboratory," which has been funded by the NSF CSforAll program for $1M. Congratulations to Mike Saks and Michal Koucký for receiving the Best Paper Award during the 2018 edition of the IEEE Annual Symposium on Foundations of Computer Science (FOCS), one of the most prominent theoretical CS conferences, for the paper "Approximating Edit Distance Within Constant Factor in Truly Sub-Quadratic Time" by Diptarka Chakraborty, Debarati Das, Elazar Goldenberg, Michal Koucký and Mike Saks. Prof. Bhattacharjee granted research awards from the NSF and VMware. Congratulations to CS faculty member Abhishek Bhattacharjee, whose research lab has recently been awarded two research grants. Ioannis Polykretis, a first-year PhD student advised by Prof. Konstantinos Michmizos at ComBra Lab, wins the 3-year Onassis Award, the oldest and most prestigious scholarship Award for Greek PhD students in countries worldwide, with a success rate of 1-2%. Congratulations to Rutgers CS PhD graduate David Menendez ! David Menendez's dissertation "Practical Formal Techniques and Tools for Developing LLVM's Peephole Optimizations" has been selected to receive the ACM SIGPLAN John C. Reynolds Dissertation Award. Congratulations to Rutgers CS PhD student Jay Lim on winning the Gold Medal in the Student Research Competition at PLDI 2018 in the graduate category. Jay is a PhD student under the supervision of Prof. Santosh Nagarakatte. His project was titled "Automatic Verification of Assembly Implementations of Cryptography Software". Widely used cryptography software such as OpenSSL have thousands of lines of hand-written and perl-generated assembly for performance. Ioannis Polykretis, a first-year PhD student, advised by Prof. Konstantinos Michmizos at ComBra Lab, was selected to receive a $5,000 Fellowship Grant from the Gerondelis Foundation for his research on the computational role of astrocytes, the most abudant, yet long-neglected, brain cells that are now being revealed to be key components in processing, transferring and learning information in the brain. Konstantinos Michmizos wins an Intel Grant Award on Neuromorphic Computing for his single-PI proposal entitled "Spike-based Active SLAM for autonomous robots developing action habits." Konstantinos's efforts are timely placing our Department at the center of the emerging Neuromorphic Community and introduces Rutgers as one of the 10 research universities in the world having access to Intel's unique neuromorphic chip. Peddie School, an independent, coeducational boarding and day school for grades 9-12 and postgraduate located in Hightstown, NJ, has developed an exciting Interactive Math Night event for exploring the intersection of mathematics and art. This is an evening designed to make math more accessible and give Peddie’s math students an opportunity to demonstrate their knowledge. Chaowei Tan, a PhD student in the Computer Science department, advised by Prof. Dimitri Metaxas, has been awarded a Best Student Paper award at the latest International Symposium on Biomedical Imaging (ISBI) in DC for the paper "Deep Multi-task and Task-specific Feature Learning Network for Robust Shape Preserved Organ Segmentation" (authors: Chaowei Tan, Liang Zhao, Zhennan Yan, Kang Li, Dimitris Metaxas, and Yiqiang Zhan). Malihe Alikhani, a 3rd year Ph.D. student in the Department of Computer Science, advised by Prof. Matthew Stone, was one of the students that received the Fellowship for Excellence in Computation and Data Science from RDI2. The fellowship appointment is for one year and comes with $30,000 towards GA support, with potential for renewal. This award supported up to three PhD students across the university working on interdisciplinary computational research projects. The National Science Foundation's CISE Directorate announced today the appointment of Prof. Manish Parashar as the Office Director for the Office of Advanced Cyberinfrastructure. Congratulations to Manish! Professor Shubhangi Saraf has received a research fellowship from the Alfred P. Sloan Foundation that will support her work in theoretical computer science. Professor Shubhangi Saraf was among 126 scholars in the United States and Canada to receive 2018 Sloan fellowships, which have been awarded annually since 1955 to outstanding early-career scholars. “Practical Verification of Peephole Optimizations with Alive”, a paper written by Rutgers CS professor Santosh Nagarakatte and a recent Rutgers CS PhD graduate David Menendez along with collaborators Nuno Lopes and John Regehr, has been published as a "Research Highlight" article in February 2018's Communications of the ACM (CACM) magazine. Two of Prof. Bhattacharjee's research papers have received awards from the computer architecture community. His paper entitled "Translation-Triggered Prefetching" published at the International Conference on Architectural Support for Programming Languages and Operating Systems (ASPLOS) 2017 has been selected as one of the top 12 papers published at all architecture conferences last year, and will be included in this year's IEEE Micro's Top Picks in Computer Architecture journal. Congratulations to Andrew Dobson, Rahul Shome and Prof. Kostas Bekris as well as their Tel Aviv University collaborators, Kiril Solovey and Prof. Dan Halperin, for receiving the Best Paper Award at the 1st IEEE-RAS International Symposium on Multi-Robot and Multi-Agent Systems (MRS), which took place Dec. 4-5, 2017 on the University of Southern California campus in Los Angeles, CA. The acceptance rate of the conference was 24%. Rutgers Today highlighted the collaboration between ExxonMobil, Professor Clifford Weisel's group from the Environmental and Occupational Health Sciences Institute (EOHSI) of Rutgers University, and Dr. Kostas Bekris' PRACSYS Lab from the Computer Science Department at the School of Arts and Sciences of Rutgers University. Prof. Rebecca Wright, DIMACS Director and Professor in the Rutgers Department of Computer Science, has been named an IEEE Fellow. She is being recognized for contributions to applied cryptography and privacy. Earlier this year, she was also named a Distinguished Member of the ACM, for scientific contributions to computing. Prof. Bhattacharjee and PhD student Zi Yan's research integrated in Linux. PhD candidate Zi Yan and his dissertation advisor, Prof. Abhishek Bhattacharjee have been developing software techniques for better virtual memory management with colleagues at NVIDIA research. Their research has just been integrated into the latest long-term Linux kernel release (i.e., 4.14 series). DIMACS, the Douglass Residential College, the School of Arts and Sciences, and the Department of Computer Science welcome the second cohort of students to the Douglass-SAS-DIMACS Computer Science Living-Learning Community for Women, or CS LLC for short. Congratulations to Prof. Santosh Nagarakatte, who has just received an unrestricted research gift from Intel Corporation for the year 2017-2018. The gift, for an amount of $75000, funds his research in the area of “Pragmatic abstractions, techniques, and tools for LLVM verification”. This award supports Prof. Nagarakatte's project on lightweight formal tools for LLVM verification. Prof. Nagarakatte's papers on this project have been awarded the ACM SIGPLAN 2015 PLDI Distinguished Paper Award and ACM SIGSOFT 2016 ICSE Distinguished Paper Award. Prof. Abhishek Bhattacharjee and PhD student Jan Vesely have been awarded state-of-the-art FPGA equipment through Intel's Hardware Accelerator Research Program. Their proposal is entitled “Accelerating Brain Modeling Frameworks with FPGAs” and will focus on using reconfigurable FPGA hardware to accelerate large-scale brain modeling frameworks to enhance the field of computational psychiatry. Prof. Bhattacharjee has been selected for the 2017 Rutgers-New Brunswick Chancellor's Award for Excellence in Research, an annual award conferred upon one faculty member in the New Brunswick campus for achievements in scholarship. Prof. Bhattacharjee received this award "in recognition of outstanding contributions to the entire computer architecture research community, impact on the computer hardware industry, and exploration of a new research direction that holds great promise in improving our understanding of the human brain". Prof. Abhishek Bhattacharjee has published a textbook on architectural and operating system support for virtual memory with his colleague Daniel Lustig, Senior Research Scientist at NVIDIA. Virtual memory is a vital layer in all modern computer systems and eases the task of programming complex large-scale and embedded systems. This textbook studies this layer from foundational concepts to emerging research directions. Professors Mubbasir Kapadia and Gerard de Melo from the Computer Science Department and Linda Ness from the DIMACS center have received the DARPA SocialSim award, titled "Multiscale Modeling, Simulation and Analysis of Transmedial Social Environments". The award will fund 3 PhD students over a period of 4 years with a total amount of $2,029,753 in funding. "NRI: INT: COLLAB: Integrated Modeling and Learning for Robust Grasping and Dexterous Manipulation with Adaptive Hands"
be recommeded for funding (Rutgers component: $867,729). PhD student David Menendez and Prof. Santosh Nagarakatte's ICSE 2016 paper "Termination-Checking for LLVM Peephole Optimizations" has been selected as one of the Notable Books and Articles of 2016 as part of Computing Review's 21st Annual Best of Computing. The Notable Books and Articles list consists of item nominations from Computing Review's reviewers, category editors, editors in chief of journals and others in the computing community. David's ICSE 2016 paper is one of the 231 articles selected in this year's list. Congratulations to F. Betül Durak, a PhD student in the Computer Science department advised by Prof. David Cash! Betül, together with Serge Vaudenay from EPFL, gave a cryptanalytic analysis to a recent NIST Format-Preserving Encryption standard, FF3. NIST announced the meaning of their result for practice and towards implementing the possible repair of the standard proposed by Betül and Serge. Congratulations to Andrew Tjang for his award from the Rutgers School of Arts & Sciences recognizing his distinguished contributions to undergraduate education. The SIGGRAPH 1994 paper "Animated conversation: Rule-based generation of facial expression, gesture & spoken intonation for multiple conversational agents", which was co-authored by Justine Cassell, Catherine Pelachaud, Norman Badler, Mark Steedman, Brett Achorn, Tripp Becket, Brett Douville, Scott Prevost and Matthew Stone has been awarded the 2017 IFAAMAS Award for Influential Papers in Autonomous Agents and Multiagent Systems. "S&AS: FND: Reflective Learning of Stochastic Physical Models for Robust Manipulation”, be recommended for funding. "SaTC: CORE: Medium: Collaborative: Cryptographic Data Protection in Modern Systems”, be recommended for funding. Size: $1,183,465 for 3 years. Janne Lindqvist's recent work on smartphone interruptions has received a lot of attention in the popular media. The work done with his PhD students Fengpeng Yuan (CS) and Xianyi Gao (ECE) will be presented at CHI’17, the premier publication venue for human-computer interaction. Prof. Santosh Nagarakatte and David Menendez's paper selected as CACM Research Highlights Paper! Congratulations to Prof. Santosh Nagarakatte, his Ph.D student David Menendez, and their collaborators Nuno Lopes and John Regehr! Their paper "Provably Correct Peephole Optimizations with Alive" has been selected as the Communications of the ACM (CACM) Research Highlights paper. Congratulations to Prof. Tomasz Imielinski! AMiner names Prof. Tomasz Imielinski as one of the top ten 2016 most influential scholars in database. Prof. Bhattacharjee's research selected as a Top Picks paper. Congratulations to Prof. Abhishek Bhattacharjee, whose ASPLOS 2016 paper entitled "COATCheck: Verifying Memory Ordering at the Hardware-OS Interface" has been selected for inclusion in IEEE Micro's Top Picks in Computer Architecture journal. Top Picks collects the year's most significant research papers in computer architecture based on novelty and potential for long-term impact. This work was done with collaborators at NVIDIA research and Princeton University. James Abello Joins New Network on "Culture Analytics"
A new network on Culture Analytics Network (CAN) has been established after it received support from the Danish Council for Independent Research. The network brings together applied mathematicians interested in culture analytics from the US and China, including James Abello from the Computer Science Department of Rutgers University, with Danish humanities researchers. Rutgers University will officially cut the ribbon this week on "Caliburn," a massive new supercomputer that ranks as the most powerful in New Jersey and one of the biggest in the world. Ricardo Bianchini, who has been a faculty member in the Computer Science department from January 2000 to December 2015 and is now Chief Efficiency Strategist at Microsoft Research, was selected for contributions to power, energy, and thermal management of servers and datacenters. A news article of the School of Arts and Sciences at Rutgers University highlights the Research Experiences for Undergraduates (REU) summer program run by the Center for Discrete Mathematics and Theoretical Computer Science (DIMACS) at Rutgers University–New Brunswick. DIMACS is affiliated with the Computer Science Department. Congratulations to Qian Sun, Melissa Romanus, Tong Jin, and Manish Parashar for receiving the Best Paper Award at the Second International Workshop on Extreme Scale Programming Models and Middleware (ESPM2 2016). The ESPM2 Workshop 2016 edition was held in conjunction with the International Conference for High Performance Computing, Networking, Storage and Analysis (SC 2016), Salt Lake City, Utah, USA on Friday, November 18th, 2016. Congratulations to Prof. Martin Farach-Colton for a NetApp Faculty Fellowship. The NetApp Faculty Fellowship (NFF) program was established to encourage leading-edge research in storage and data management and to foster relationships between academic researchers and engineers and researchers at NetApp. Recipients of NFF awards have demonstrated to NetApp through a proposal and review process to be working on research that is likely to make significant and relevant contributions to the greater body of work and to the storage and data management industry. A team from WINLAB received the best paper award for their paper "Visible light based activity sensing using ceiling photosensors" at the ACM Workshop on Visible Light Communication Systems (VLCS) held with the ACM MobiCom 2016 conference in New York, in October 2016. The team comprising graduates students Viet Nguyen (ECE), Mohamed Ibrahim (CS), Siddharth Rupavatharam (ECE) and Minitha Jawahar (ECE) was advised by Professors Marco Gruteser and Rich Howard. Congratulations to Prof. Santosh Nagarakatte, who has just received an unrestricted research gift from Intel Corporation. The gift, for an amount of $75000, funds his research in the area of “Pragmatic abstractions, techniques, and tools for LLVM verification”. Prof. Nagarakatte's research group is designing lightweight formal tools that enable compiler writers to develop correct peephole optimizations for LLVM, a widely used mainstream compiler. This award supports further enhancements to the Alive-NJ prototype to reason about the correctness of floating point optimizations, to assist compiler writers when optimizations are not correct, and to extend the class of optimizations handled by Alive-NJ. Congratulations to Prof. Abhishek Bhattacharjee, who has been selected to receive the CV Starr Visiting Fellowship from Princeton University's Neuroscience Institute. This fellowship is "awarded to exceptional individuals whose research focus is on areas relevant to neuroscience such as molecular biology, psychology, computer science, engineering, physics or mathematics". Prof.
Congratulations to Prof. Dimitri Metaxas, chair of the Computer Science Department, who has been elected as a Fellow of the Medical Image Computing and Computer Asssisted Intervention (MICCAI) Society. The announcement was made during the main conference of the Society, the 19th International Conference on Medical Image Computing and Computer Assisted Intervention that took place Oct. 17 to 21, 2016 in Athens, Greece. Three members of the society are elected every year. Congratulations to Prof. Santosh Nagarakatte and his Ph.D Student David Menendez , whose PLDI 2015 paper "Provably Correct Peephole Optimizations with Alive" with collaborators Nuno Lopes and John Regehr has been selected as the ACM SIGPLAN Research Highlights Paper for this year. The new US News & World Report ranking the Computer Science Departments is out, and our Department has improved its Ranking 6 positions for 2017. DIMACS is organizing a conference to celebrate the contributions of CS Prof. Eric Allender and Mathematics Prof. Mike Saks in the two corresponding fields on the occasion of their 60th birthday. The conference will take place January 26 to 27 at Rutgers University. The industrial affiliates program (IAP) run by the Rutgers Department of Computer Science aims to help computer science majors find jobs and internships in their field. Kulikowski and colleagues recognized at MIE Conference. At the MIE (Medical Informatics Europe) 2016 Conference during the General Assembly Meeting of the International Medical Informatics Association (IMIA) on August 28th, Prof. Casimir Kulikowski was presented with a certificate for the IMIA Working Group of the Year Award for 2015, which was won by the IMIA History Working Group, which he chairs. AMD has publicly disclosed details of its upcoming Zen microprocessor, which will shipped in desktops, laptops, servers, and CPU-GPU systems in 2017. One of their innovations is a mechanism to improve the performance of TLBs, an important hardware component in modern chips. This “coalescing” TLB mechanism is inspired by Prof. Bhattacharjee and his group’s research and papers at MICRO 2012 and HPCA 2014. $4 million DIBBS grant awarded. A TV segment produced about the Art&AI lab is nominated for the Mid-Atlantic Emmy's award in the "Arts/Entertainment News Single Story" category. The segment was aired on PBS New Jersey and Philadelphia couple of months ago and can be seen here. Congratulations to Prof. Martin Farach-Colton, who has just received an NSF grant for his project entitled “Theory and Implementation of Dynamic Data Structures for the GPU.” The grant is collaborative with John Owens of UC-Davis, and Rutgers’ portion of the grant is $349,409.00. Congratulations to Prof. Zheng Zhang, who has just received an NSF grant entitled ?XPS: EXPL: Cache Management for Data Parallel Architectures,” for an amount of $300,000, covering a three-year period. She is the sole investigator on the project. Current advances in computer science and other disciplines rely on the massive computation horsepower of data parallel architectures, such as GPUs. Programming data parallel architecture is not easy, as it requires the efficient handling of data movements across the memory hierarchy of thousands of processing cores. Congratulations to Prof. Ulrich Kremer, who has just received an NSF grant entitled “CSR:Small:Energy-aware Redundancy Management,” for an amount of $494,075, covering a three-year period starting 10/01/2016. He is the sole investigator on the project. Redundancy is a fundamental system characteristic that improves productivity and resilience. Each such system has multiple, redundant configuration options with their specific resource requirements and cost/quality tradeoffs. Michmizos receives Busch Biomedical grant. Congratulations to Prof. Konstantinos Michmizos, who has received a Busch Biomedical Grant Award for his project, entitled “Computational Neuromodulation: Neuromarkers to personalize Deep Brain Stimulation.” The award is highly competitive, with only 5% of submitted proposals receiving an award. Prof. Rebecca Wright, who also sits on the board of CRA-W, recently participated in a briefing of the congressional Diversity in Tech Caucus, hosted by Sen. Amy Klobuchar (D-MN) in the Capitol on June 22nd. Together with others, she explained why efforts to increase the participation of women and underrepresented minorities in STEM fields, particularly computing, were worthy of continued Federal support. Award paper at Digital Libraries conference. Congratulations to Long Le, Prof. Chirag Shah, and co-authors. Their paper ?Evaluating the Quality of Educational Answers in Community Question-Answering? just received the Best Student Paper Award in the Joint Conference on Digital Libraries 2016:http://www.jcdl2016.org/program The paper was also nominated and considered for the Best Paper Award. Rutgers new supercomputer, named “Caliburn,” is ranked #2 Among Big Ten Universities and #8 Among U.S. Academic Institutions by the Top500 List. The system will provide cutting-edge computing power and data storage to researchers statewide. The project to build this supercomputer was headed by Prof. Manish Parashar, the founding director of the Rutgers Discovery Informatics Institute (RDI2). Congratulations to Profs. Ahmed Elgammal and Vladimir Pavlovic for being promoted to the rank of Professor, effective July 1, 2016. Bekris and Yu receive NSF grant. Computer Scientist, Photographer or Both? A Rutgers Today article, titled “Computer Scientist, Photographer, or Both?” profiles recent Rutgers Computer Science graduate, Shirley Yu. It covers her unique interests, spanning computer science and photography. Shirley’s photography recently made it to the cover of Time magazine: the March 7th issue of Time features a photograph by Shirley of passengers traveling in a driverless convertible. The article also quotes Prof. Alex Borgida, who interacted closely with Shirley. The data center for the world’s richest source of oceanographic data, Ocean Observatories Initiative, recently became operational at Rutgers University. The OOI cyberinfrastructure team is led by Manish Parashar, distinguished professor of computer science and founding director of the Rutgers Discovery Informatics Institute (RDI2), in collaboration with Scott Glenn and Oscar Schofield, distinguished professors of marine and coastal sciences and directors of the Rutgers University Center for Ocean Observing Leadership (RU COOL). Best student paper at IEEE SOSE 2016. Congratulations to Ph.D. students Mengsong Zou and Ali Reza Zamani (advisor: Prof. Manish Parashar) and their co-authors for winning the Best Student Paper Award at the 2016 International IEEE Symposium on Service-Oriented System Engineering (http://sose2016.uk/index.html). Rutgers #21 in Semantic Scholar. Each year, the Computer Science Graduate Student Society (CSGSS) votes to recognize excellence in graduate-level teaching. For the 2015-2016 academic year, CSGSS has given its teaching award to Prof. James Abello, with Prof. Konstantinos Michmizos the runner-up. Congratulations to both of them. Best paper award for Borgida. Congratulations to Prof. Alex Borgida and his co-authors for being awarded the Ray Reiter Best Paper Prize at the 2016 International Conference on Principles of Knowledge Representation and Reasoning (http://kr2016.cs.uct.ac.za). Congratulations to Prof. Dimitris Metaxas and his collaborators for being awarded a DoD Multi-University Research Initiative (MURI) grant. The participating universities in this grant proposal include UMD, UA, UCSB, Rutgers, and Stanford. The grant?s title: “SCAN: Socio-Cultural Attitudinal Networks” in the Topic ?Media Analytics for Developing & Testing Theories of Social Structures & Interaction.? Rutgers?s portion of the grant is $1M over 5 years. NSF grant for James Abello. Congratulations to CS undergraduate student Ian Mertz, who has been selected to attend the 2016 Heidelberg Laureate Forum as a student participant. Selection to participate as a student in the Heidelberg Laureate Forums is highly competitive, and participants are selected from a world-wide pool of applicants. Only the 200 most qualified young researchers are granted the opportunity to experience the unique atmosphere of the Heidelberg Laureate Forum, from September 18-23 in Heidelberg, Germany. SIGMOBILE Test of Time Award. Congratulations to Prof. Badri Nath and his former Ph.D. student, alumnus Dr. Ajay Bakre (now at NetApp), for being selected as a winner of the inaugural Test of Time award, 2016, from SIGMOBILE, the ACM Special Interest Group on Mobile Computing Systems. The SIGMOBILE Test of Time awards have recently been constituted to acknowledge publications that have had a great influence on the community with the only requirement that the publication be at least 10 years ago. The publication venue does not need to be a SIGMOBILE related event. A committee headed by Prof.
Three faculty members promoted, awarded tenure. The Board of Governors of Rutgers University met yesterday, and voted to promote and award tenure to three faculty members, Prof. Kostas Bekris, Prof. Abhishek Bhattacharjee, and Prof. Swastik Kopparty. Effective July 1st, 2016, they will be promoted to the rank of Associate Professor. Congratulations to Ph.D. student David Menendez and Prof. Santosh Nagarakatte for receiving an ACM SIGSOFT Distinguished Paper Award for their paper Termination-Checking for LLVM Peephole Optimizations at ICSE’16, the 38th International Conference on Software Engineering, to be held May 14-22, 2016, in Austin, Texas. ICSE is the premier venue for research in software engineering. This year, ICSE accepted 101 papers for publication out of 530 submissions, and 9 of the accepted papers were designated ACM SIGSOFT Distinguished papers. The Art and Artificial Intelligence Lab was featured on PBS NJTV and WHYY Philadelphia. The State of the Arts culture show interviewed Professor Ahmed Elgammal and Ph.D. Candidate Babak Saleh who talked about the activities and achievement of the lab. Paper featured on CFAR website. Team secures 2nd place in SDN Throwdown. 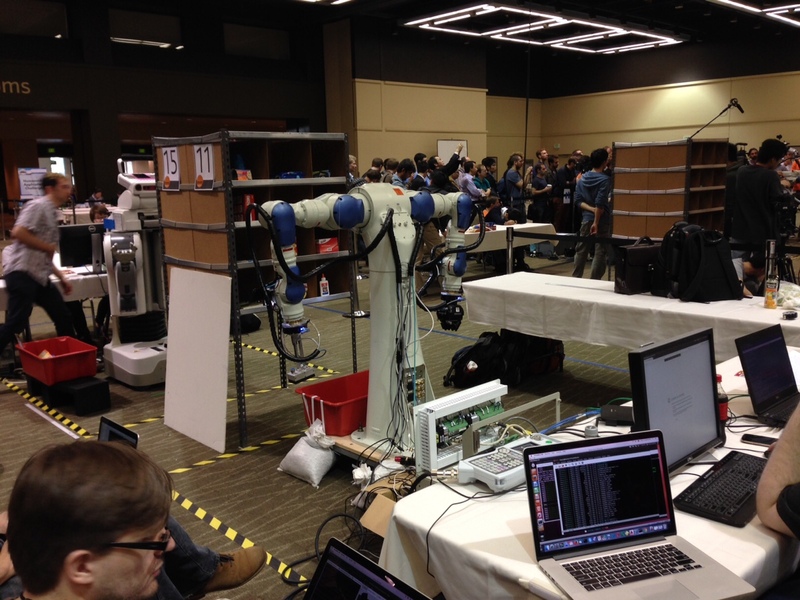 Three graduate students, Tanuj Chawla, Eduard Renart and Riham Elsaadany, participated in a SDN Throwdown event organized by Juniper networks, and won second place. Two best paper awards at FAST 2016. Members of the department have garnered two best paper awards at FAST’16, the 14th USENIX Conference on File and Storage Technologies. FAST’16 recognized two of the published papers this year with best paper awards. We are delighted to announce that both papers have Rutgers authors on them. FAST is being held February 22-25 in Santa Clara, California, and is the leading conference that publishes research on file systems and storage technologies. The conference received 115 submissions, of which 27 were selected for publication, and two selected as best papers. Badri Nath recognized by UMass-Amherst. Congratulations to Prof. Badri Nath, who has just been recognized by his alma mater, UMass Amherst for Outstanding Achievement in Research. He earned his Ph.D. degree from UMass in 1989. Prof. Mubbasir Kapadia has co-written a book (with M. Kallmann), entitled “Geometric and Discrete Path Planning for Interactive Virtual Worlds,” to be published by Morgan and Claypool. Qualcomm Innovation Fellowship 2016 Finalists. The competition received 129 eligible applications this year from the 18 participating US schools. Each team submitted a proposal, to be considered for funding by the fellowship. A team of over 200 reviewers selected the 34 finalist teams. Congratulations to Babak Saleh and his Ph.D. advisor Prof. Ahmed Elgammal, for winning the Outstanding Student Paper Award at the Thirtieth AAAI Conference on Artificial Intelligence (AAAI-16). The paper, “Toward a Taxonomy and Computational Models of Abnormalities in Images,” was co-authored with collaborators Prof. Jacob Feldman, from Rutgers Psychology, and Prof. Ali Farhadi, from the University of Washington. The paper will be presented at AAAI-16, to be held in Phoenix, AZ from February 12-17, 2016. Rutgers victorious in Fall 2015 Hackathon Season. Vinod Ganapathy delivers Prof. R. Narasimhan Memorial Lecture. Prof. Vinod Ganapathy delivered the Prof. R. Narasimhan Memorial Lecture at the Tata Institute of Fundamental Research (TIFR) in Mumbai, India, on December 17th. This lecture was the third in the annual lecture series organized by TIFR and sponsored by the TIFR endowment fund. The annual lecture series is organized in memory of Prof. R.
Congratulations to our undergraduate student, Geet Sethi, an advisee of Prof. Abhishek Bhattacharjee, for winning an honorable mention for the Computing Research Association’s (CRA) Outstanding Undergraduate Male Researcher Award in the PhD-granting institutions category! NSF sub-award for Santosh Nagarakatte. The CS Department has been selected to participate in the National Center for Women Information Technology (NCWIT) 2016 Pacesetters Program. Participants in this program commit to setting measurable goals and an actionable plan for increasing the representation of women in computing over a two-year timeframe. More information on this program can be found at: https://www.ncwit.org/programs-campaigns/pacesetters. Metaxas elevated to IEEE Fellow. Prof. Mubbasir Kapadia co-authors new book describing computational models of interacting digital humans in semantically rich virtual environments. The book is entitled “Virtual Crowds: Steps Toward Behavioral Realism.” See here for details: http://www.morganclaypool.com/doi/abs/10.2200/S00673ED1V01Y201509CGR020 This volume presents novel computational models for representing digital humans and their interactions with other virtual characters and meaningful environments. 1. How to draw statistically valid conclusions from data? Rutgers participating in Northeast Big data hub. The NSF designated four regional Big data innovation “hubs” to share data, tools and ideas related to big data. Rutgers is a participant in the Northeast Big data innovation hub, being led by Columbia University. See: http://datascience.columbia.edu/exploring-big-data-solutions-northeastThe article mentions Prof. Manish Parashar, who will co-lead one of the focus areas on Discovery Science. Parashar receives NSF BIGDATA grant. Congratulations to Prof. Manish Parashar, who has just received an NSF BIGDATA grant for his project entitled “Fractured Subsurface Characterization using High Performance Computing and Guided by Big Data.” The grant is for an amount of $214571, and the project runs from September 2015 to September 2018. The project is a collaborative effort with Prof. Mary F. Wheeler (Lead PI) and Prof. Mrinal Sen (co-PI) of The University of Texas at Austin, and Prof.
Congratulations to Prof. Santosh Nagarakatte, who has just received a research grant from Intel Corp. The grant, for an amount of $75000, funds his research in the area of “Lightweight Formal Methods for LLVM Verification and a MPX target for LLVM.” Compilers form an integral component of the software development ecosystem. Unfortunately, compiler bugs in mainstream compilers are common, which manifest either as crashes during compilation, or, much worse, result in the silent generation of incorrect programs. Best student paper at MICCAI 2015. Congratulations to Prof. Dimitris Metaxas and his Ph.D. advisee Menglin Jiang, who won the best student paper award at MICCAI 2015, the 18th International Conference on Medical Image Computing and Computing Assisted Innovations, held in Munich, Germany. Rutgers Today carries a feature story about VideoWall, a video portal designed by LCSR and the department of computer science, to help Rutgers connect across campuses and foster collaborative learning experiences. The article quotes Doug Motto of LCSR and Prof. The department of computer science is pleased to host the Computer Science for High School Teacher Workshop (CS4HS) on August 17th and 18th. http://cs4hs.cs.rutgers.edu/The event, sponsored by Google, brings together high-school, middle-school and elementary-school level computer science educators for an exciting two day event. Bekris awarded NASA early career grant. Congratulations to Prof. Kostas Bekris, whose proposal titled “Robust Planning for Dynamic Tensegrity Structures” to the NASA Early Career Faculty program has been funded. The grant provides $600K support over a period of 3 years starting this October. Tensegrity is an exciting concept pursued by NASA as a potential planetary exploration platform. The link below shows a video showing the robot developed at NASA Ames from their collaborator, Dr. Vytas SunSpiral, based on tensegrity principles:Prof. In partnership with DIMACS and the Douglass Residential College, the Rutgers Computer Science department is excited to announce plans to develop a living-learning community for women in computer science at Rutgers. The program, open by application to female first-year students interested in majoring in computer science, includes a residential program as well as mentoring and co-curricular activities for the students, and is intended to enhance their success and increase the number of women computer science majors at Rutgers. Coverage of Prof. Ahmad Elgammal’s work. Professor Ahmad Elgammal and his group’s research on using computers to evaluate pieces of art has been featured in the NBC News and Washington Post website. Adarsh Yoga wins 3rd place in PLDI 2015 SRC. Congratulations to Ph.D. student Adarsh Yoga (advisor: Prof. Santosh Nagarakatte), who has won third place in the graduate student category of the Student Research Competition (SRC), held at the ACM SIGPLAN 2015 Conference on Programming Language Design and Implementation (PLDI) held at Portland, Oregon. He wins a cash prize of $200, a bronze medal, and a two-year complimentary membership to the ACM and a subscription to the ACM Digital Library. 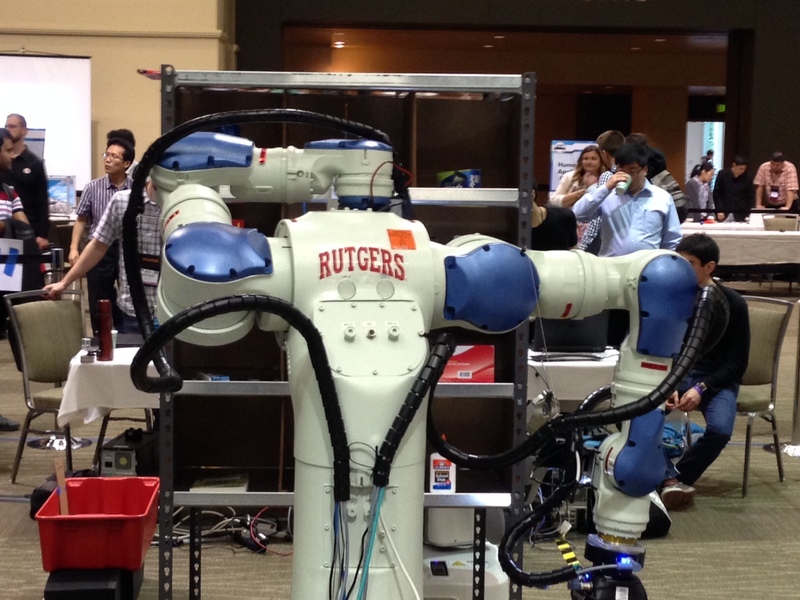 Rutgers team places 7th in Amazon Picking Challenge. The first Amazon Picking Challenge, a new competition in robot manipulation, just concluded today and Prof. Kostas Bekris’ team ended up on the 7th spot out of the 28 teams that participated (40 of them initially registered). His team collected 17 points for picking items out of a shelf, which was close to the score of the 3rd team but some calibration and robot driver problems caused us to drop an item and lose the 3rd spot. Congratulations to Prof. David Cash, who has just been awarded the prestigious NSF CAREER award for his project entitled “CAREER: Cryptography for Secure Outsourcing.” The grant runs from June 2015 to May 2020 and is for a total amount of $566,912. The project considers a situation that is all too common today: Individuals and organizations routinely trust third party providers to hold sensitive data, putting it at risk of exposure. The department is pleased to announce the addition of four new tenure-track assistant professors and two non-tenure-track teaching faculty members, starting in Fall 2015. Bianchini in HPCA Hall of Fame. The IEEE International Conference on High Performance Computer Architecture (HPCA) recently created a “Hall of Fame,” which lists authors with at least 6 papers published in HPCA conferences over the years. Congratulations to Ph.D. student Benjamin Lund (advisor: Professor Shubhangi Saraf), who has been selected to attend the 2015 Heidelberg Laureate Forum as a student participant. Selection to participate as a student in the Heidelberg Laureate Forums is highly competitive, and participants are selected from a world-wide pool of applicants. The US student delegation in 2014 only included 20 individuals, who were supported by the NSF. Congratulations to Professor Santosh Nagarakatte, his Ph.D. student David Menendez, their collaborators Nuno Lopez (MSR Cambridge) and Professor John Regehr (U. Utah) for winning the distinguished paper award at the ACM SIGPLAN 2015 Conference on Programming Language Design and Implementation (PLDI). Metaxas receives $3M NIH grant. Congratulations to Professor Dimitris Metaxas, who has just received a new NIH grant for his project entitled “Innovative MRI-based Characterization of Cardiac Dyssynchrony.” The grant runs from April 2015 to March 2020 and is for an amount of $3,175118. Mrinal Kumar wins Simons Fellowship. Congratulations to Ph.D. candidate Mrinal Kumar (advisors: Swastik Kopparty and Shubhangi Saraf) for being awarded a Graduate Theory Fellowship from the Simons Foundation. “Ad hoc positioning system (APS) using AOA,” IEEE INFOCOM 2003, by Dragos Niculescu and Badri Nath. Mubassir Kapadia’s work featured in ACM Tech News. The March 4th edition of ACM Tech News features new faculty member Mubassir Kapadia’s work from the time that he was employed at Disney Research Zurich. Student selected for KPCB fellows program. Revan Sopher, a computer science student at Rutgers, has been selected for one of the premier fellowships in technology: the Kleiner Perkins Caufield and Byers (KPCB) Fellows Program (http://kpcbfellows.com/). He is part of the less than 3% selected for the program out of the applicant pool and is also featured on KPCB’s site under meet the fellows. Kleiner Perkins Caufield and Byers is a leading venture capital firm in the Silicon Valley. This unrestricted gift to Rutgers from Google, for an amount of $231,000, was awarded effective February 24, 2015 as part of Google’s 3X in 3 years program. The grant initially runs for one year, with an option of support at the same funding level for another two years. Professor Rebecca Wright has been selected to participate in CRA’s 2015 CCC Leadership in Science Policy Institute (LiSPI), which is to take place in April 2015. Paper selected for IEEE Micro Top Picks. Congratulations to Prof. Abhishek Bhattacharjee, MS alumnus Bharat Pitchai (currently with Amazon.com) and their collaborator Lisa Hsu (Qualcomm Research) for their upcoming IEEE Micro Top Picks 2015 paper “Address Translation for Throughput Oriented Accelerators”. Congratulations to Prof. Manish Parashar who joins the 2014 class of ACM Distinguished Members as a distinguished scientist. The paper by Anshumali Shrivastava and Ping Li on “Asymmetric LSH (ALSH) for Sub-linear Time Maximum Inner Product Search (MIPS)” has won the “NIPS 2014 Best Paper Award”. The MIPS problem has widespread applications in search, learning, and optimization. This paper developed a simple “trick” which, by applying asymmetric transformations on the data and query separately, converts the MIPS problem into a conventional near neighbor search problem for which efficient sublinear time algorithms exist. This is the second best paper award Shrivastava and Li won in 2014. Congratulations to Prof. Endre Szemeredi, who has just added another entry to his long list of awards and honors with an honorary degree. He has been awarded the degree of Doctor of Honoris Causa from the University of Buenos Aires. Congratulations to Prof. Ricardo Bianchini, who has been elevated to IEEE Fellow from 2015. The official citation for this honor is “for contributions to server and data center energy management”. Press coverage of Rutgers hackathons. Rebecca Wright was one of the participants in the NY Times “Room for Debate” on the very timely and important topic of “Keeping Credit Cards and Bank Account Data from Hackers”. Elgammal’s work in Washington Post. An article by Rutgers math professor Bahman Kalantari has been selected for the prestigious collection The Best Writing on Mathematics: 2014 (published by Princeton University Press). His article, “The Fundamental Theorem of Algebra for Artists,” originally published in the Math Horizons, appears alongside stellar contributions from Brian Hayes, John Conway, Keith Devlin, Jordan Ellenberg, and Francis Edward Su, among others. Congratulations to Prof. Rebecca Wright, who has just been awarded a new NSF grant for her project entitled ” CIRCLE: Catalyzing and Integrating Research, Collaboration, and Learning in Computing, Mathematics, and their Applications”. The $1 million grant runs for five years starting from August 2014. Congratulations to Prof. Dimitris Metaxas, who has received a $780,800 grant from AFOSR for his project entitled “Dynamic Integration of Motion and Neural Data to Capture Human Behavior“. The project runs from September 2014-2017. Congratuations to Prof. Kostas Bekris, who has just been awarded an NSF grant “EAGER: Provably Efficient Motion Planning After Finite Computation time”. The $175,000 grant runs from 9/1/2014 to 5/31/2015. Congratulations to Prof. Dimitris Metaxas, who has just received an NSF grant for his project: “EAGER: Multi-modal human gait experimentation and analysis on unconstrained terrains”. Congratulations to Prof. Martin Farach-Colton, who has just received an NSF grant for a collaborative project with SUNY Stony Brook and MIT. The project is entitled “CSR: Medium: Collaborative Research: FTFS: A Read/Write-Optimized Fractal Tree File System”. Parashar awarded NSF EAGER grant. Congratulations to Prof. Manish Parashar, who has just been received an NSF grant entitled “EAGER: Exploring Federations of Campus and National Cyberinfrastructure as Scalable Platforms for Science: A Case Study using Open Science Grid”. Congratulations to Prof. Richard Martin, who has just been awarded a new NSF grant entitled “CSR: Medium: Collaborative Research: Enabling Mobile Safety Systems”. This three-year grant runs from October 1, 2014-September 2017, and is a collaborative effort with Prof. Marco Gruteser of Rutgers ECE, Prof. Yingying Chen at Stevens Institute of Technology and Prof. Jie Yang at Florida State University. The total grant amount is $700,000, of which Rutgers’ share is $350,000. Fran Trees awarded two new grants. Congratulations to Fran Trees, who recently received two new grants. The first is an NSF CE 21 Grant (Computing Ed for the 21st Century) “Collaborative Research: CS10K: Infusing Cooperative Learning into Computer Science Principles Courses to Promote Engagement and Diversity.” The total amount of the grant is $854,484.00, and it is a collaborative effort with Dr. Jeff Gray, University of Alabama and Dr. Owen Astrachan, Duke University. Congratulations to Prof. Santosh Nagarakatte, who has received a gift of $70,000 from Intel Corporation. Santosh’s Ph.D. thesis research on memory safety led to the development of new software and hardware for memory safety. Intel’s recently-announced MPX extensions for memory safety are similar in design to those proposed in Santosh’s Ph.D. dissertation. His doctoral work also led to the development of SoftBound/CETS, a software-based solution to memory safety problems. Congratulations to Profs. Vinod Ganapathy, Santosh Nagarakatte and Liviu Iftode, who have been awarded a new NSF grant from the Secure and Trustworthy Cyberspace (SaTC) program, under the Secure, Trustworthy, Assured and Resilient Semiconductors and Systems subprogram. The new grant, “SaTC:STARSS: Hardware-assisted Methods for Operating System Integrity,” runs from October 2014-September 2017, and is for an amount of $499,988. The project will investigate novel, formally-verified hardware mechanisms to improve operating system integrity. This three-year $499,880 grant runs from October 2014-September 2017, and will support research on improving cloud platform security. This three-year $963,196 grant runs from June 2014-May 2017, and is joint with Prof. Smaranda Muresan of Columbia University. Prof. Elgammal’s share of the grant is $499,988. Prof. Zhang awarded NSF grant. Congratulations to Prof. Zheng Zhang, who has been awarded a new NSF CCF grant for her research on compiler and runtime system optimizations for concurrent programming. The award for $378,141, entitled “Optimizing Compiler and Runtime for Concurrency-Oriented Execution Model,” runs from August 2014 to September 2017. This weekend a team of Rutgers students attended the Rutgers-organized HackRU hacking marathon/competition to build a brand new invention in 24 hours. The team built a party photographer robot called Party PhotoBot. Out of 600 attendees from different schools and their inventions, our invention won the first place! Daily Targum wrote an article on the HackRU and mentioned the invention. Turgay Senlet and Tarek El Gaaly are working on their Ph.D. Degrees with Prof. Ahmed Elgammal and Mustafa Gokhan Uzunbas is working on his Ph.D. Degree with Prof. Dimitris Metaxas in CBIM. Targum quotes Tonde on STEM education. The Daily Targum has an article about STEM education that quotes CS Ph.D. student Chetan Tonde. In addition to serving as a TA for multiple courses, Chetan has, on multiple occasions, served as the instructor for CS205 (Discrete Mathematics I) during the summer months. The article describes Chetan’s approach to teaching, which emphasizes blackboard presentations and student understanding. Eliassi-Rad receives two new grants. Nguyen receives Microsoft SEIF grant. From 0-350 in Three Years. Best architecture paper at IPDPS’14. The paper “An improved data stream summary: The count-min sketch and its applications,” authored by Graham Cormode and S. Muthukrishnan, published in LATIN 2004, has been awarded the 2014 Imre Simon Test-of-Time Award. The award will be presented in the conference Latin American Theoretical Informatics (LATIN) 2014. Congratulations to Professor Muthukrishnan and his collaborator, Graham Cormode. Congratulations to Prof. Santosh Nagarakatte, who has just received a Google Faculty Research Award. He was awarded an amount of $63500 for his project entitled “Semi-Automated Verification of LLVM Optimizations using SMT Solvers”. The department is delighted to announce that two papers by faculty members have been selected for inclusion in the “25 years of International Conference on Supercomputing”. Prof. Apostolos Gerasoulis’ paper, ” PYRROS: static task scheduling and code generation for message passing multiprocessors,” and Prof. Ricardo Bianchini’s paper, “Energy conservation techniques for disk array-based servers,” were both selected to receive this honor. Hacker League acquired by Intel. Hacker League was founded by former Rutgers students: Mike Swift (who graduated in Spring 2012 with a CS undergraduate degree), Abe Stanway, and Ian Jennings. Prof. Eliassi-Rad awarded NSF grant. Prof. Bhattacharjee awarded Google grant. Congratulations to Prof. Abhishek Bhattacharjee, who has received a $42K Google Faculty Research Award for his proposal, entitled “Efficient Virtual Memory for Emerging Big-Data Workloads.” This project will investigate performance and energy efficient hardware support for virtual memory, particularly in the face of emerging workloads with massive memory footprints, and hardware trends like larger caches, heterogeneity, and scale-out systems. Rich Martin awarded NSF grant. Intel’s recently-proposed Memory Protection Extensions include several features similar to those proposed in Prof. Santosh Nagarakatte’s Ph.D. dissertation. Prof. Ricardo Bianchini, who have received two new NSF grants. Bekris receives two new grants. Congratulations to Prof. Kostas Bekris and his group for receiving two new grants. The first is a grant associated with the 2013 NASA Space Technology Research Fellowship (previously awarded to his student Zakary Littlefied). This grant will total $272K over four years. The second grant is a $40K travel grant from NSF for his proposal to the US-Israel Collaboration in Computer Science. Over the next three years, this grant will allow Kostas’s group to visit and collaborate with Dr.
We are delighted to announce that Ping Li will join our faculty, jointly appointed as an Associate Professor in the Department of Computer Science (49%) and Department of Statistics (51%). Professor Li joins us from Cornell, where he was an assistant professor in the Department of Statistical Science and in the Faculty of Computing and Information Science. He holds a Ph.D. in Statistics and Masters degrees in Electrical Engineering and in Computer Science, all from Stanford University. Congratulations to all our new graduates. Marian and Nguyen’s Google Research Grant featured on Rutgers News. A Google Research Grant, recently awarded to Prof. Amelie Marian and Prof. Thu Nguyen, was featured on Rutgers News. The grant, for $62,500, funds their research on customized searches through a user’s stored and online information. The department congratulates Xiaolei (Sharon) Huang (PhD 2006, advisor Prof. Dimitris Metaxas) on being promoted to associate professor with tenure at Lehigh University.